Mohamed Jamal, of Juniper Road, Crawley, was fined £220, with £57.50 vehicle excise back duty, and £90 costs. He had been convicted in his absence of keeping an unlicensed vehicle on a public road in Crawley. Harry Cope, 19, of Raleigh Walk, Crawley, was fined £40, with £24.17 vehicle excise back duty, and £50 costs. He had pleaded guilty to keeping a vehicle on a public road while it was subject to a SORN declaration. Steven Johnson, 32, of Ardingly Close, Crawley, was fined £367, with £96.67 vehicle excise back duty, and £90 costs. He had pleaded guilty to keeping a vehicle on a public road while it was subject to a SORN declaration. David Maslyn, of Dalewood Gardens, Crawley, was fined £440, with £115 vehicle excise back duty, and £90 costs. He had been convicted in his absence of keeping an unlicensed vehicle on a public road in Crawley. Camiran Merza, 39, of Broadway, Pontypridd, was fined £220, with £32.50 vehicle excise back duty, and £90 costs. He had been convicted in his absence of keeping an unlicensed vehicle on a public road in Crawley. No 1 Cleaning Services Ltd, at Charlwood Road, Ifield, was fined £220, with £18.75 vehicle excise back duty, and £90 costs. The company had been convicted of keeping an unlicensed vehicle on a public road in Crawley. Christopher Curtis, 36, of Lismore Road, Whitstable, was fined £310, with a £20 victim surcharge, and £85 costs. He had pleaded guilty to being drunk on a flight to Gatwick, and to using threatening, abusive or insulting words towards a member of cabin crew. Bobby Stapleton, 18, of Kensington Road, Crawley, was fined £40, with a £20 victim surcharge, and £60 costs. He had pleaded guilty to possessing a Class B drug (cannabis). Gary Johnson, 51, of no fixed address, was given a community order with a £50 fine, a £20 victim surcharge, and £85 costs. He had pleaded guilty to assault in Crawley. Gerald Maughan, 45, of Ifield Road, Crawley, was given a community order with a four week curfew, £202.50 compensation, and a £60 victim surcharge. He had pleaded guilty to three counts of theft from Debenhams, and to causing criminal damage to a cooker top, window, and gate, all in Crawley, and admitted breaching a conditional discharge. Charles Musoke, 48, of Stephenson Way, Crawley, was banned from driving for three and a half years, with a £220 fine, a £20 victim surcharge, and £85 costs. He had pleaded guilty to drink driving, driving without insurance, and driving without a licence, all in Crawley. Giuseppe Sapienza, 62, of Massetts Road, Horley, was banned from driving for six months, with a £1,320 fine, and £170 costs. He had been convicted in his absence on two counts of failing to identify a driver suspected of committing an offence. Dominic Ellis, 52, of Willowmead Close, Woking, was fined £75, with a £20 victim surcharge, £85 costs, and three penalty points added to his licence. He had pleaded guilty to speeding at Crawley. Callum Musgrove, 19, of Atherfield Road, Reigate, was fined £100, with a £20 victim surcharge, £85 costs, and three penalty points added to his licence. He had pleaded guilty to speeding at Crawley. Kamil Ziopaja, 33, of Fairlawns, Horley, was fined £660, with a £66 victim surcharge, £85 costs, and six penalty points added to his licence. He had been convicted in his absence of failing to identify a driver suspected of speeding. Mitlesh Sharma, 39, of Cherry Lane, Crawley, was given a one year conditional discharge, a £15 victim surcharge, and £85 costs. 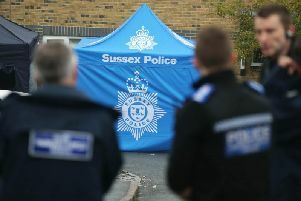 He had pleaded guilty to selling late night food at Subway in High Street, Crawley, outside of the terms of a licence. Lynn Loughran, 25, of Beulah Road, Thornton Heath, was given a community order with 120 days of unpaid work, a £60 victim surcharge, and £85 costs. She had pleaded guilty to burglary with intent to steal at Premier Stores, Crawley. Anthony O’Driscoll, 26, of no fixed address, was jailed for 14 weeks, with an £80 victim surcharge, and £85 costs. He had pleaded guilty to common assault and theft from Debenhams and Tesco, breaching the terms of an early release, and failing to answer bail, all in Crawley, and to two counts of possessing a Class A drug (heroin and crack cocaine). Darren Lovell, 39, of Wychwood Road, Furnace Green, was fined £75, with a £20 victim surcharge, and £85 costs. He had pleaded guilty to theft from Morrisons in Crawley, and admitted breaching the terms of an early release, and breaching a conditional discharge. Urfan Ahmed, 38, of Burdock Close, Crawley, was fined £785, with a £78 victim surcharge, and £1,500 costs. He had pleaded guilty to breaching a court order by having custody of a dog. Kevin Kerr, 45, of no fixed address, was fined £30, with a £20 victim surcharge. He had pleaded guilty to being drunk and disorderly at Gatwick Station, and admitted breaching the terms of a release from prison. Sachin Nayee, 23, of Chippendale Road, Crawley, was banned from driving for a year, with a £120 fine, a £20 victim surcharge, and £85 costs. He had pleaded guilty to driving with illegal levels of a cannabis metabolite in his blood. Paul Pinner, 52, of Puffin Road, Ifield, was given a two year conditional discharge, with a £15 victim surcharge, and £85 costs. He had pleaded guilty to theft in Horsham. Conroy Downie, 59, of Mapesbury Road, London, was fined £80, with a £20 victim surcharge, and £85 costs. He had pleaded guilty to possessing a Class A drug (cocaine) at Crawley.